Eszter joined CMT’s Summer Math Program for Young Scholars in the Summer of 2017. She applied to this program in order to improve her math skills, and learn new topics of math that aren’t covered in her school. Her favorite part of the program was the Number Theory class. She learned a lot of new theorems and ways of problem solving which helped grasp concepts much better. 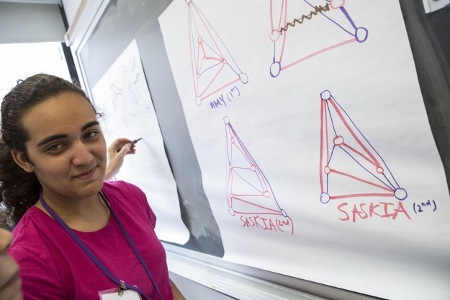 The classes and talks at this program gave her a better understanding of the kind of work that professional mathematicians do. She was surprised because most of the math fields they were in were very different from the kind of math that she was used to -- it was more “pure” math. She found this kind of math very interesting, and thinks she would go into a math field when she graduates from high school as well. Eszter is currently in the 10th grade at Hunter College High School. At her high school, she is participating in various extracurricular activities such as the math team, where she did various competitions each year, such as SBIMC, Purple Comet, and Math League. She also volunteered as a peer tutor in her school, tutoring students in grades below her in math. She also takes Saturday math classes at the program Math-M-Addicts. She recommends CMT’s Summer Math program for students looking to be introduced to college level math topics, learn interesting new types of math, and solve challenging math problems. Dora joined CMT’s Summer Math Program for Young Scholars in the Summer of 2017. Her desire to learn about advanced math topics was the main reason why she applied to the program. Before CMT, Dora had not had much exposure to advanced math topics such as number theory, group theory and graph theory. She assumed that people did math purely for fun at a high level, but she now understands that even subjects that at first seem very pure can end up having surprising uses in everyday life -- how math applies to the real world. Dora is currently in the 10th grade at Horace Mann School. After she graduates from high school, she wants to continue studying math and ultimately become a research mathematician. 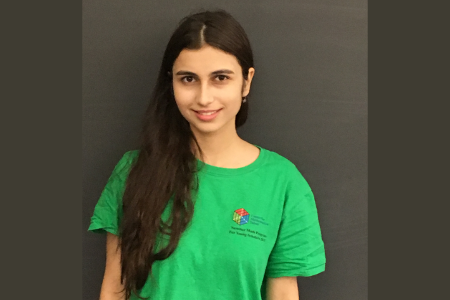 In the past, she attended Summer Programs at Center for Talented Youth and next year she is planning to attend the Columbia Science Honors program. 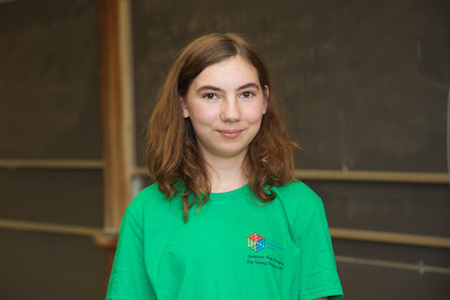 Moreover, she just started an internship at MoMATH (National Museum of Mathematics) this Fall 2017, which she plans to continue through the next three years. Dora has kept herself busy with extracurricular activities, including her school’s math team and a math magazine that she started called Prime. She definitely recommends CMT because not only did she get to improve her problem solving skills, but also was able to get exposure to higher level math topics, and got an idea of what math classes in college really look like. Saskia participated in the CMT Summer Math Program for Young Scholars in the Summer of 2016. It was her curiosity in learning about other topics in mathematics outside of her classroom and desire to experience class in a university setting that led her to applying. Her favorite moment about the program was learning about graphing in the real world. In Saskia's own words, "I never knew a subway map was an actual graph. To me, not only was that mind-blowing but it was a lesson where I was exposed to seeing math used in a real world situation that people benefit from daily." Her math journey had just begun, and Saskia discovered that Math was not just a mere core subject where one just takes test, but rather something that has an effect on our whole world and lives. Her experience with this program "only further catapulted [her] desire and goal to attend college." She is in fact planning to attend NYU after graduating from high school. Saskia is currently a junior at the Energy Tech High School. She keeps herself very much active through various extracurricular activities. She is the founder and president of the college readiness program at her school, she is one of the school's ambassadors, she is in the Math Club and Women in STEM Club, and she is also a tutor to elementary school students . Her active leadership roles in these activities have earned her awards and have shaped the student morale of her school. Saskia highly recommends CMT Summer Math Program for Young Scholars to everyone "because students can learn a lot of math skills in which they can transfer into their high school work but also gain exposure of what it is like to be a university student and to sit in a classroom of one of the most respected universities in the country."